Yesterday, it was announced via Twitter and Facebook that Motorola was to hold a giveaway for the Moto 360 via the Yo app. All you had to do was add Motorola on Yo, send a Yo at them, then wait during a specific period this afternoon for them to Yo you back. Before the giveaway went live, it was stated that only 20 people would win the Moto 360, but thanks to what we are assuming is some type of minor goof, it appears that hundreds of entrants, if not more, were sent links saying they had won the Moto 360 (pictured above). 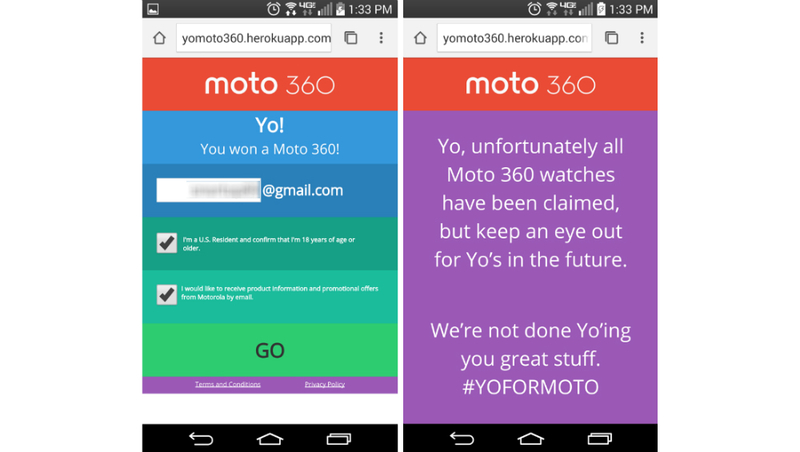 I personally received a Yo back from Motorola, taking me to a site that claimed I had won a Moto 360. After entering my email address, the site said all 360s had been claimed and I had lost. But wait, I thought it said I won? Once an official comment on the mishap comes from Motorola, we will update the post. Did you fall victim to Motorola? Let us know below.